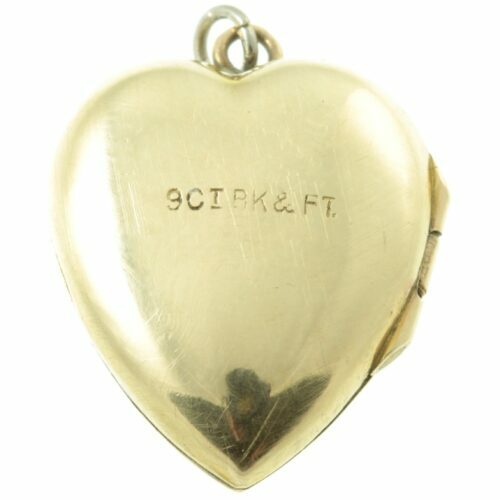 A traditional heart-shaped locket. 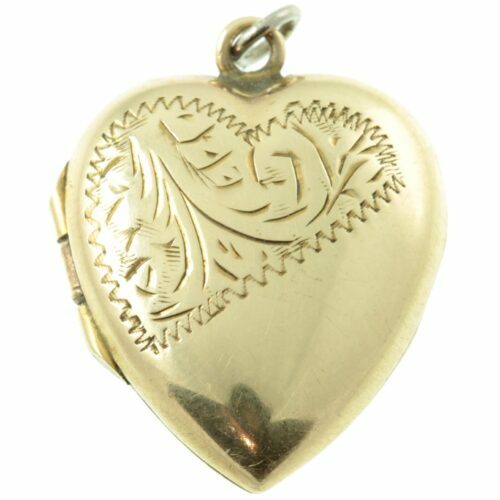 This beautiful heart locket is made of shiny 9ct yellow gold and features ornate etching on the front. The locket opens to reveal two heart-shaped photo/picture frames within. The heart locket is a symbol of love, that will be forever in fashion. Size : 22mm X 18mm, weight : 2.9g. Period: Modern Jewellery (the 1960s onwards ). All items are presented in one of our beautiful signature boxes, with complementary delivery worldwide on all orders. 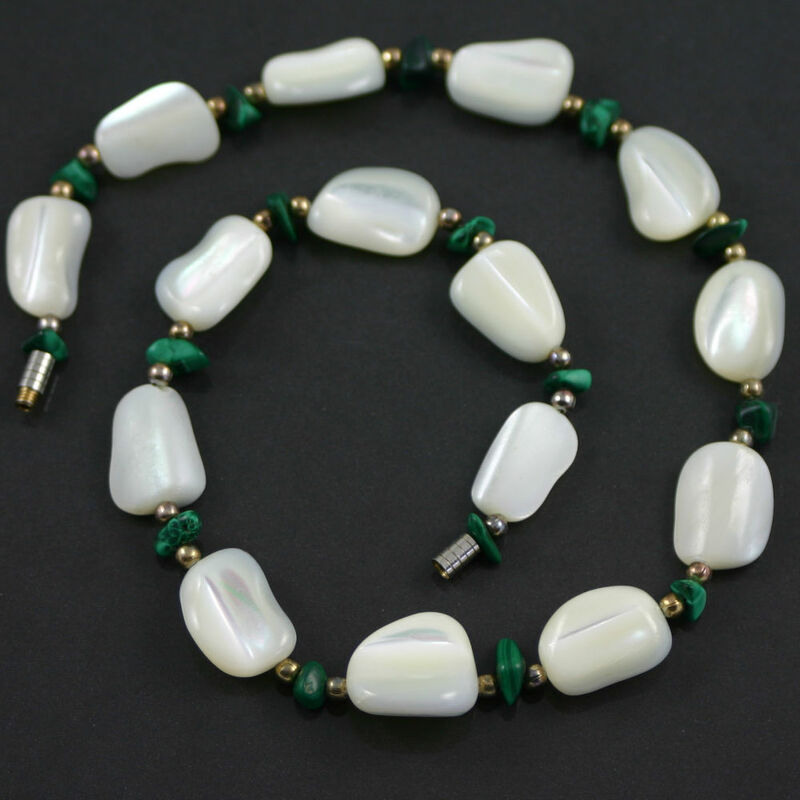 An eye-catching white agate necklace. 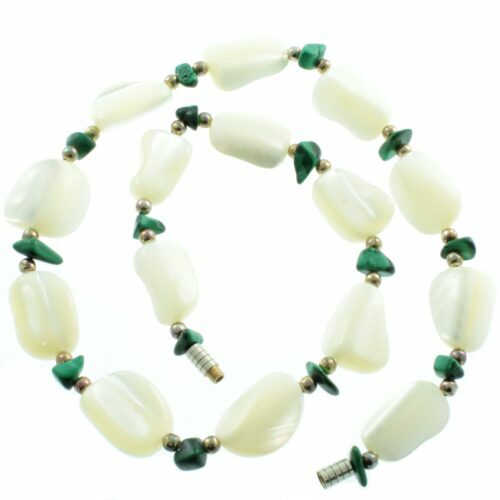 Highly polished white agate nuggets, together with malachite nuggets have been hand-strung and set to a barrel clasp. These polished agate nuggets have a luxurious shine which contrasts beautifully with the rich green malachite nuggets. A one-of-a-kind piece. Length : 41cm (16″), width : 14mm, Weight : 37.1g. Period : Mid-Century Jewellery ( 1950s ). All items are presented in one of our beautiful signature boxes, with complementary delivery worldwide on all orders. A timeless malachite bangle. 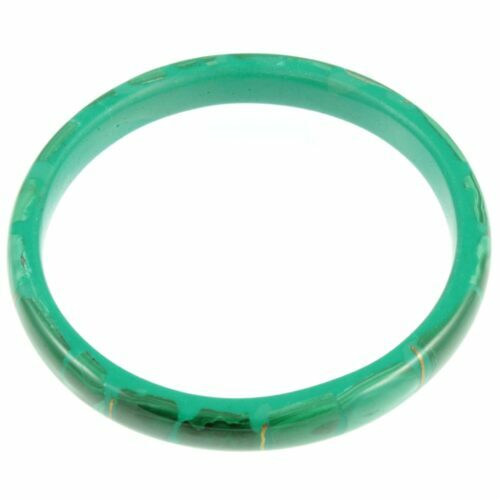 This highly polished malachite bangle has been made from one piece of malachite, which is very rare. 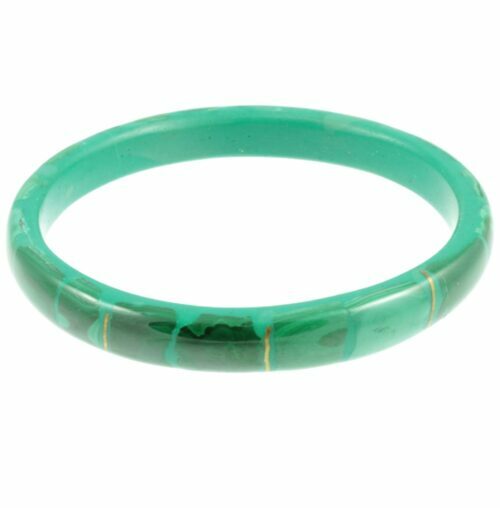 There are a number of natural inclusions in this bangle which have been filled with molten brass, then grounded and polished to the same level as the malachite. These brass infilling are quite unique and showcases the jewellers high level of skill and craftsmanship. 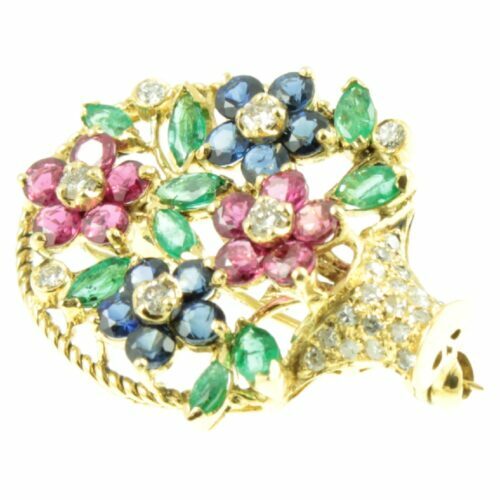 A stunning piece of vintage jewellery which deserves to be treasured. Size : 64mm inside diameter x 9mm wide, weight : 35.7g. Period: Retro Jewellery (the 1940s). 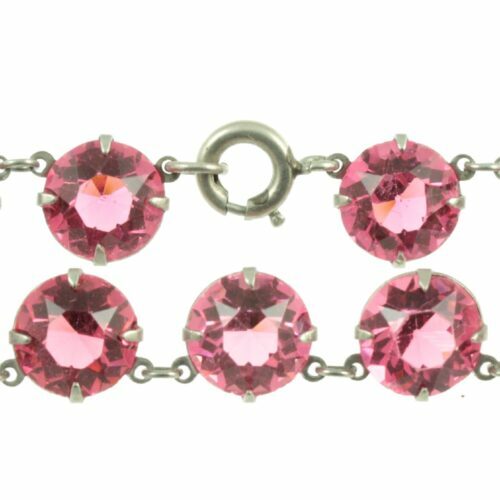 A delicate fuscia pink crystal necklace. Round cut faceted Czech glass is securely set in silver and finished with a spring ring clasp. The superior sparkle that comes from Czech crystal is due to the higher percentage of lead which they used, making their crystal world famous. An original and beautifully made vintage costume necklace. Size: (L) 39cm x (W) 9mm, weight 21.3g. Period: Retro Jewellery (the 1940s ). All items are presented in one of our beautiful signature boxes, with complementary delivery worldwide on all orders. A unique pair of diamond and sapphire stud earrings. 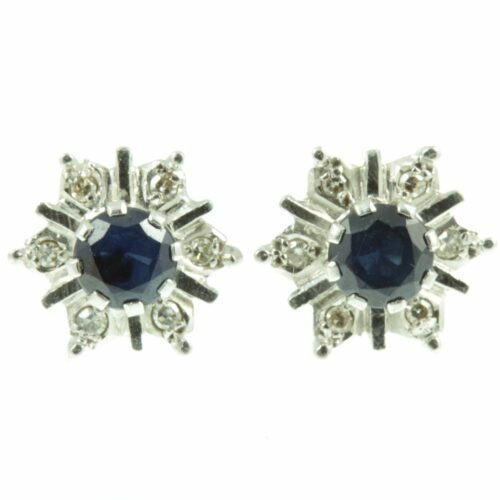 Two round cut sapphires gemstones weighing 23 points each, are set in a 9ct white gold. 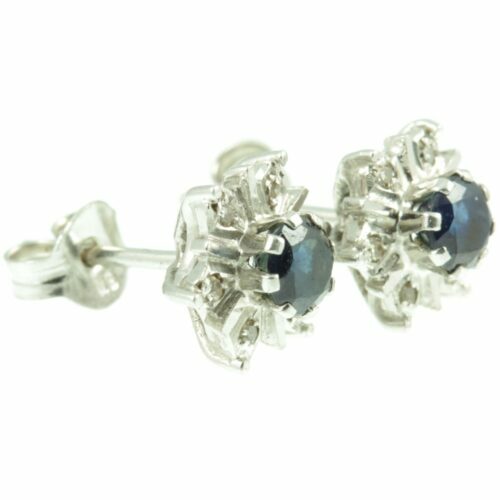 These gorgeous sapphires are surrounded by diamonds which a combined weight of 12 points in each earring. A beautifully designed pair of vintage stud earrings. Size: 9mm in diameter, total sapphire carat: 46 points, total diamond carat: 12 points, weight 1.2g each. Period: Mid-Century Jewellery ( the 1950s ). 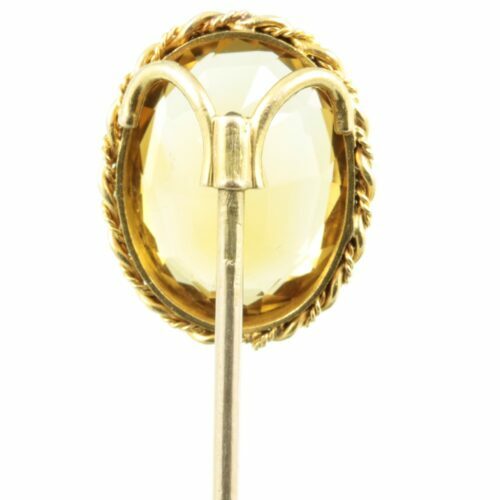 An exceptional oval cut citrine stickpin brooch. This bright and vibrant citrine gemstone, weighting 4.7ct has flawless clarity and a beautiful depth of colour. 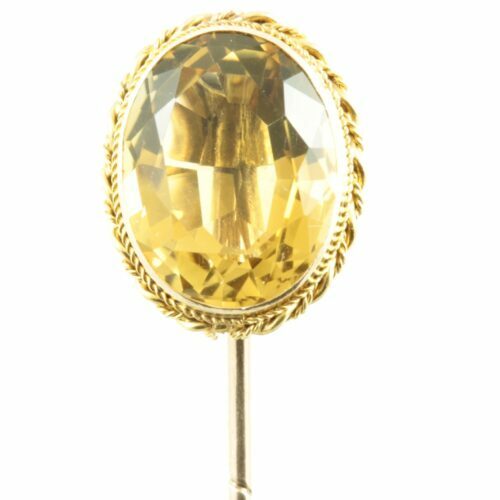 Novemember`s birthstone citrine, was very popular during the 19th century and was widely used in both jewellery and in intaglio work. This antique gemstone is set in rich 15ct gold employing a rub over setting and surrounded by a double border of twisted gold ropes. An elegant and understated piece of fine antique jewellery. Size: 78mm x 9mm, weight: 3.4g. Period: Victorian Jewellery ( 1837 – 1901 ). 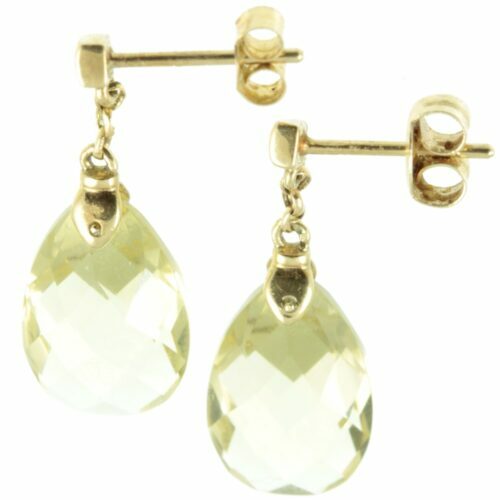 An exquisite pair of citrine drop earrings. A pair of beautiful briolette citrine gemstones weighing 3.9ct each, have been attached to a rich 9ct yellow gold setting by means of a gold rivet. 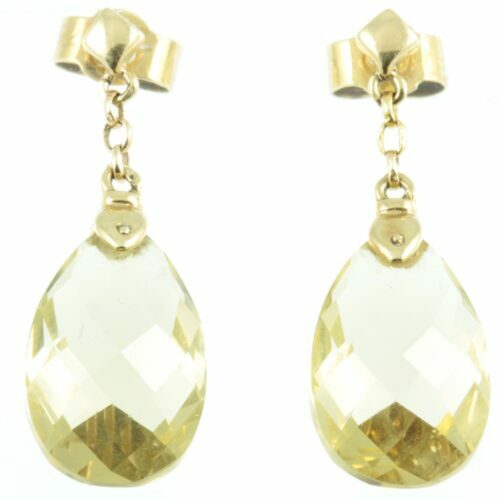 These citrines have remarkable clarity and catch the light beautifully. These beautifully designed earrings are very flattering when worn. Size: 25mm x 9mm, total citrine carat: 7.8ct weight 1.5g each. Period: Mid-Century Jewellery ( the 1950s ). 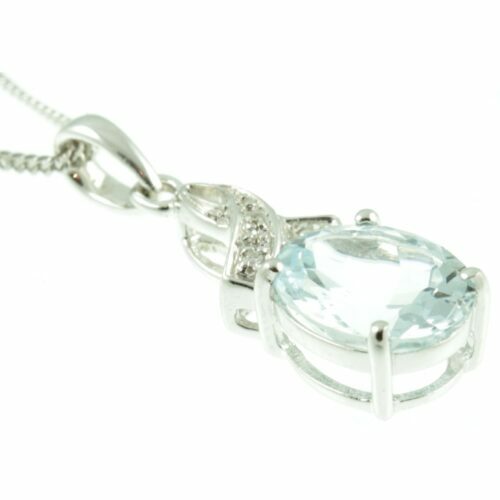 An attractive aquamarine and diamond pendant necklace. 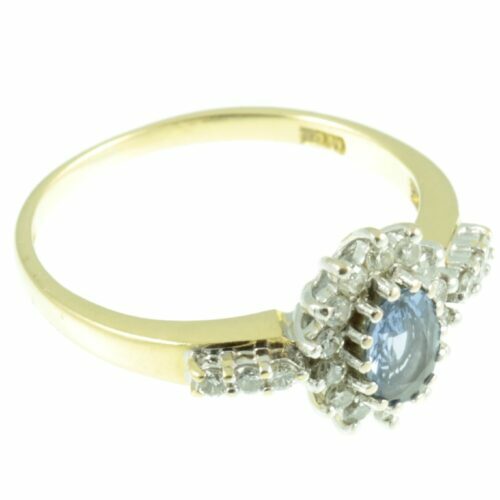 A crystal clear aquamarine gemstone weighing 2.19ct, which catches the light beautifully. Is set in 9ct white gold using a claw setting which makes the gemstone very secure. 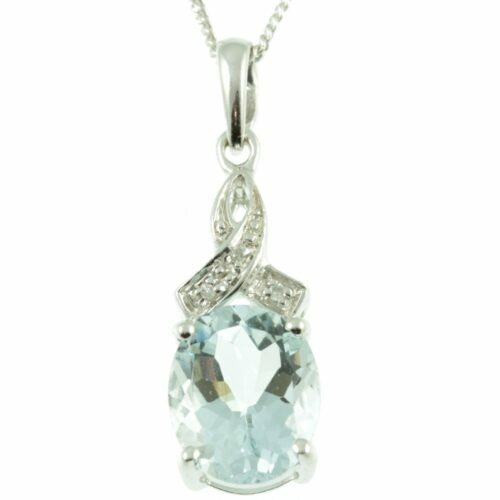 Above this gorgeous aquamarine is a diamond accented ribbon made of 9ct white gold. This vibrant aquamarine has stunning clarity and a beautifully delicate bluish - green colour. The pendant is suspended from a 9ct white gold chain. A desirable piece of jewellery. Pendant size: 26mm x 8mm, chain length: 40cm, weight: 3.3g. Period : Modern Jewellery ( 1960s onwards ). All items are presented in one of our beautiful signature boxes, with complementary delivery on all orders. An exceptional Ceylon sapphire & diamond ring. A stunning oval-cut Ceylon sapphire weighing 60 points is set in 18ct white gold with a claw setting. This cornflower blue sapphire has amazing clarity along with beautiful colour saturation, allowing it to sparkle and dance as it catches the light. 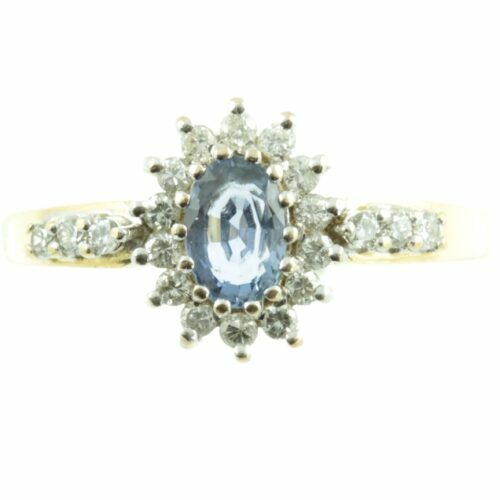 The name Ceylon is given to sapphires which have been mined in Sri Lanka, sapphires have been mined there for thousands of years and are highly prized for their colour, radiance and luminosity. Surrounding the sapphire and extending down each shoulder is 20 brilliant round cut diamonds, which have a combined weight of 40 points. These diamonds are set in an 18ct white gold secure claw setting. While the band is made of rich 18ct gold, which produces a beautiful contrast. Simply beautiful. Ring size : UK size O, US size 7.25, width 11 mm, weight 3.4g, this ring can be re-sized free of charge, upon request. Period: Modern Jewellery ( the 1960s onwards ). A breathtaking giardinetti basket pendant. The basket and rope twist handle is made from rich 14ct yellow gold, with the basket being studded with nineteen round cut diamonds, which sparkle beautifully. The basket is filled with a profusion of diamond, sapphire and ruby flowers. Together with emerald leafs and diamond buds. All of the gemstones used in this giardinetti basket are very well matched, with each one having excellent clarity and colour saturation. 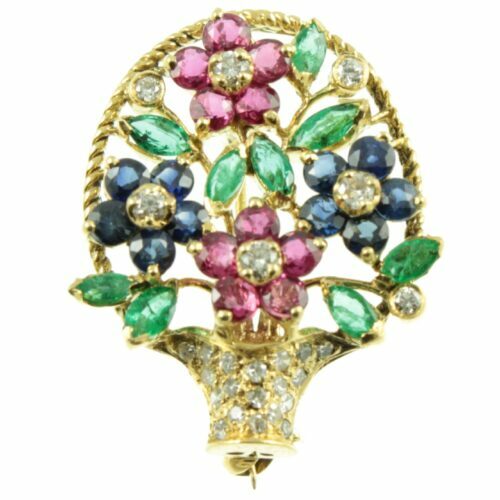 This exquisite piece can be worn as either a pendant or a brooch. Diamond weight: 50 points, Ruby weight: 60 points, Sapphire weight: 60 points, Emerald weight: 36 points, Size: 26mm x 21mm, weight: 4.9g. Period: Modern Jewellery (the 1960s onwards ). All items are presented in one of our beautiful signature boxes, with complementary delivery worldwide on all orders.